Designed for small and home based businesses. Plug in power, phone lines and network connection. 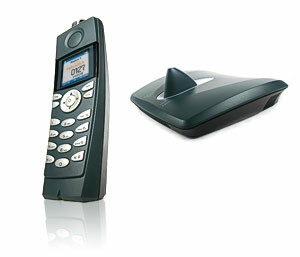 Use a Talkswitch Analog Phone or any standard wired or cordless phone. 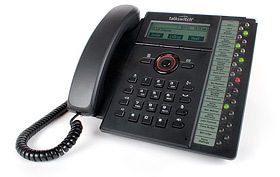 Connect Talkswitch IP phones for remote workers or for Multi line functions. Built in Music on Hold. Customize by adding your own music and messages. 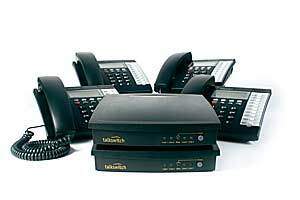 TalkSwitch systems can be expanded by upgrading or networking units together. 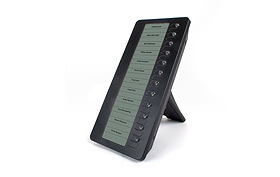 Up to 9 customizable Auto Attendants can answer lines automatically or as a backup for your attendant. 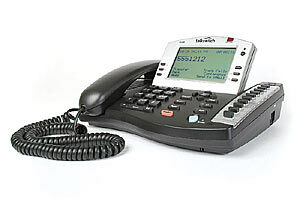 Plug in your Fax, modem or interac machine for added flexibility and better use of your phone lines. Fax calls are directed automatically. 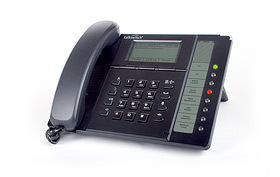 VOIP enabled systems can add up to 8 low cost VOIP lines for Direct In Dial lines and extra outgoing capacity. With this module, up to 5 Bluetooth® headsets can be paired with a TS-550i phone. Adds more time for auto attendant and voicemail messages. 1 hr, 2 hrs, 4 1/2 hrs, and 9 hrs. 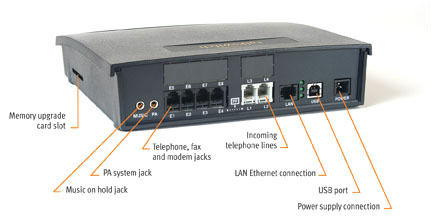 Adds 8 VoIP trunks to a TalkSwitch 240vs, 280vs, 480vs or 840vs. 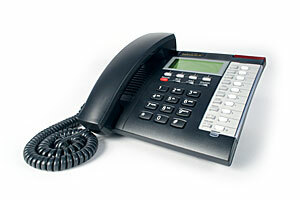 Adds capacity for 2 traditional phone lines and 4 local extensions to a TalkSwitch 240vs, 244vs or 248vs. With up to 9 levels of auto attendant, so you can offer multiple options for callers and simple 1 button acces to your staff. Complete voicemail system with custom greetings and setup options. Your choice of music or recorded messages that can advertise your company. Call Transfer, Call Hold and Call Pickup from any phone. Ring more than one Phone simultaneously and use different ring patterns to identify types of calls. Calls to busy or unanswered phones have the option of leaving a message remaining on hold, or return to the auto attendant. Calls can also be forwarded to other extensions or telephone numbers. Call Cascade If your extension is busy, not answered, screened, or on do not disturb, calls can ring a sequence of other extensions or ring groups. Uniform Call Distribution Incoming calls are queued at a ring group if all the group's extensions are busy. Calls are retrieved in the order they arrived as ring group members become available. Handle incoming calls differently at different times of the day, days of the week and on holidays. TalkSwitch can professionally handle calls during and after regular business hours. Integrate mobile and remote workers, and give your customers a single number to contact you. Automatic Hotline Calling Automatically dial a set number when a specific phone is picked up. Perfect for door phones. Automatically send certain kinds of outgoing calls through specific phone lines. All long-distance calls, for example, can use a specific line or group of lines. Prevent unauthorized long-distance calling from any local extension. Assign accounts to calls and track time spent on calls for billing of professional services. Change configuration of the system remotely. Route faxes without wasting money on a dedicated fax line. VoIP Enabled* Place branch-to-branch long-distance calls over the Internet and access VoIP services. Call Waiting If another call comes in while you're on the phone, you are notified and the caller ID is displayed. You can easily toggle between calls. Store up to 100 numbers on your system for easy access. Caller-ID Routing Handle calls differently based on where they come from. Intercom Place calls from one extension to another. Public Announcement TalkSwitch can be connected to a PA system, or announcements can be made through the speakers of selected TalkSwitch telephones. Distinctive Ring You can have different kinds of calls handled in different ways. TalkSwitch supports telephone company distinctive ring features. Call Screening Records a caller's name, then plays it to the recipient, who can accept or redirect the call. See which lines are available or in use, right on your TalkSwitch IP set. Customize which lines to view for each extension. Exclusively available with TS-9133i and TS-480i phones. Up to 32 phone lines, 32 VoIP lines and 64 local extensions per location. Modular architecture and intelligent networking capabilities allow for flexible office configurations. 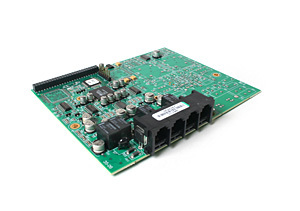 Parts and service for all major telephone systems. Avaya AT&T Comdial NEC Lucent Mitel Nortel Panasonic Samsung Toshiba Talkswitch Vodavi and lots more!